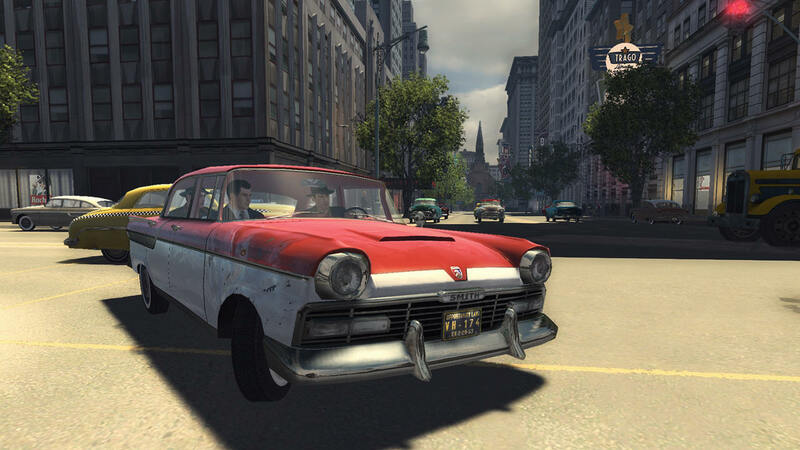 RPS is very pleased to have been one of the first websites in the world to see Mafia II running. We took a trip to 2K Czech, in their Czech Republic headquarters, and saw how the game is coming together. So far, so good. They were allowed to continue with our blessing. Below are detailed impressions of the game at this stage in development, along with five brand new screenshots (click on them for the full versions). Mafia II is authentic. Authentic to its 1940/50s setting, and authentic to its origins. It’s been seven years since Mafia. That might normally be an enormous gap between sequels, if it weren’t for the affection with which the original is remembered. It was a bold game, developed alongside GTA III, but taking open world gaming in a very different direction. What’s perhaps most fascinating about what we learned when visiting 2K Czech’s headquarters is how defiantly Mafia II intends to pursue that direction, rather than reinventing the game as yet another GTA clone. Heavily focused on the story, despite far more side quests and interactive locations in the brand new city, Empire Bay, the team proudly explain its linear nature. This is about telling one powerful story. This isn’t to say that the city isn’t going to be dramatically more involved. Throughout twenty neighbourhoods, shops, mechanics and many other locations can be visited, with clothing bought, cars tweaked, and sights seen. Empire Bay, inspired in parts by New York, Chicago and San Francisco, is intended to be the most interesting aspects of the best American cities distilled into one enormous area. Set a decade on from the end of Mafia, the Second World War is over, and America is going through the transition of the lean 40s into the flourishing 50s. This is a whole new story, with a new cast, in a new city. Apparently allusions to the original Mafia will be made, but only as slight treats for fans, rather than involved plot points. (You have to wonder if Empire Bay just might be the place witness protection relocated Tommy Angelo to – it’d be splendid if you could find his white picket fence-surrounded house.) So once again the city will evolve with the passing of time, but in a superbly involved way. Cars will change on the streets as the years go by, but so will interiors. You play Vito Scalleta, who is frequently accompanied by his childhood best friend, Joe. 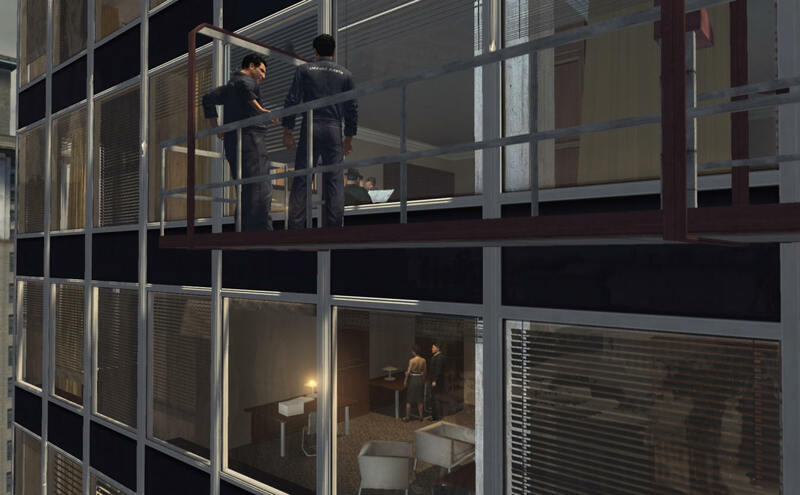 Throughout the game you’ll visit Joe’s apartment, which changes as the years go by to the reflect the tastes (and tastelessness) of the era. It begins quite plain, sensible, orderly, and littered with women’s underwear. (We presume from his ladyfriends, rather than a special secret surprise about Joe himself.) By the boom of the 50s it’s a garish mess of neon kitsch, his kitchen looking like a diner. Littered with women’s underwear. Studio tours are often a slightly awkward obligation when visiting a developer. You’re there to see the game in action, interview people involved, and complain about the sandwiches. Traipsing through the corridors of a development studio is generally polite handshakes and concerns that you’re disturbing someone who’s in the middle of crunch, as they show you how they designed the teapots. I was humbled by my tour of 2K Czech, when the sheer scale of Mafia II became clear. Eight people work just on the AI. Eight. Let’s talk about the AI for a moment. You’ll know if you’ve played open world games that the pedestrians tend to be either set decoration or targets for the psychopathic. In Mafia II the pedestrians have a choice of how to think. In fact, 2KC refer to them, and indeed rival gangsters, police and any other NPCs, as having “brains”. There’s the individual brain, and the team brain, and their actions are decided by a combination of the two. So, say there’s a dead body lying in a park. Any number of pedestrians may be around, but their team brain will choose which runs up to investigate. The others will be assigned different behaviours, maybe to panic, stand and watch. But if a police officer is around, this changes, the team brain deferring to authority with the policeman approaching. He may respond by trying to investigate the crime. Or maybe you’re trying to fight four or five gangsters in the park. Their team brain will allow them to work together, choosing positions, cover and targets, even flanking you. But if one finds himself in individual danger, his own brain will overrule the team, and he’ll act to preserve himself. If his hit points are low, he’ll make a run for it. It also plays a part in melee combat, so if you’re fighting three people at once, only one will attack while the other two cheer him on. The team brain also defines police responses to crimes they witness. They won’t only react to your felonies, but those of anyone else on the streets. A gangster may decide to jack a car, and if spotted a pursuit could begin in which you have no involvement. Mafia’s police force was famously picky. Catching you driving at 41mph, they’d eventually send the entire city’s units after you in a ludicrous misdirection of resources. 2K Czech promise this is much improved, although insist that the police will still react to speeding. Just perhaps not quite as forcefully, and relative to the nature of the crime. There’s another smart way of getting out of police trouble. Bribery. The option will be available when being given a ticket, and later in the game when you’re rich and influential enough, you could pull over to a phone booth and give the police headquarters a ring, tell them to call off the chase. With so much focus on story, there’s a reasonable question to ask about how a Czech-based development team can create such an American-centric tale. It turns out by doing an extraordinary amount of work. The original script, written by respected Czech author, Daniel Vavra, was 600 pages long. Three or four times longer than your average film. This was first translated into English by what we’re told was an extremely competent translator. And then it was polished once again by 2K’s American voice director, Jack Scalici, who just happens to be an Italian American New Yorker. This same process was repeated for any changes made, ensuring that the script was authentically accented, authentic mafia dialogue from New York. Frustratingly little is being said about what the story’s about at this point. In fact, almost nothing is known, beyond it being about Vito’s journey from humble working man to flush mafia success. With such an emphasis put on this aspect by the developers, it’s a shame that we weren’t given some teasers, but presumably that’s still to come. There is, however, much to say about the depth of detail going into everything else. The music comes from their own composer (who baulked another trend of the studio tour by making the visit to the music department a highlight, as he performed some beautiful in-game music for us live on his keyboard), and will be recorded by the no less than the Prague Philharmonic. There’s also a massive collection of licensed music from the era for in-car radio, which will apparently alter its playlist to suit the time of day. The city changes in more ways than one. Not only will the architecture update as time moves forward, but you can exact your own change upon it in real-time. Objects are destructible in a splendid way. During a shoot-out in a bar, we watched with amazement as wood splintered exactly where it was hit – something all objects will apparently reflect. Flammable materials will catch light when you throw a Molotov cocktail at them, and the heat fire generates will even cause nearby tyres to burst. If you loved smashing phone booths in the first Mafia, then the entire city should become a lunatic’s playground. In an effort to eradicate the open world’s silliest element, there’s to be a ton of pedestrian designs. There are (so far) 250 non-essential NPC character faces, each designed to look distinct and realistic. 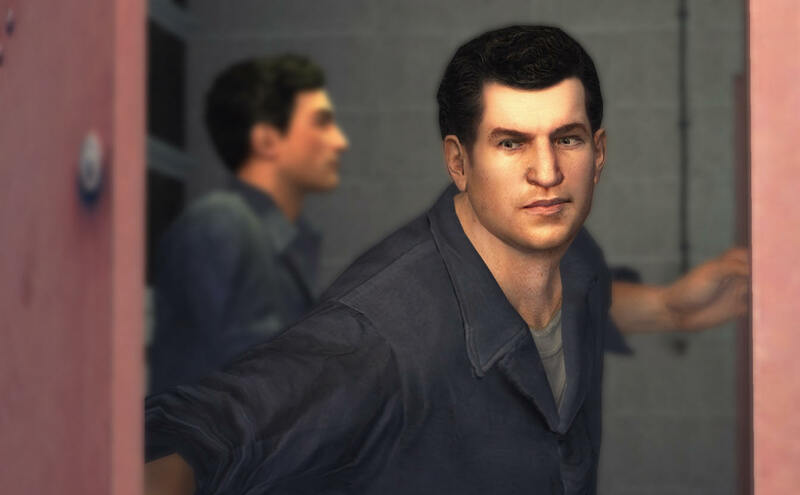 2002’s Mafia set the bar for character faces, and from the brief glimpses we had, Mafia II looks certain to step up the game once again. 2K Czech have their own motion capture studio, which is but a small part of the effort that’s going into the cutscenes. The motion capture actors were even given real weapons (something a developer wryly mentioned wouldn’t have been possible in other European countries) to ensure their movement was affected by the weight of each gun correctly. Perhaps my favourite of this extraordinary details dedicated just to cutscenes is the way the dialogue was recorded. Using established actors in LA, they had them – and this is something we’ve been begging developers to do for years – record their conversations together. So rather than the traditional stilted awkwardness of in-game chatting, the conversations will flow naturally, people’s intonation matching their companions’. Even better, they made sure every actor came back for a second session to get pitch perfect lines. Like the AI, there’s an entire section of the studio dedicated to those solely working on the cutscenes. Fans of the original Mafia will remember how these were a league ahead of their peers back then, and it seems likely other games are going to be embarrassed into improving by the results here. We watched a truncated version of a mission, apparently running to about an hour in the game, but lasting twenty minutes in this demo, in which Vito and Joe break into a skyscraping office complex. They first steal janitor uniforms to pass security, make their way to the rooftop after being let through vital doors to clean up a mess, and kill everyone working up there. Then using the window cleaning platform, lower themselves to the level on which their target works. Clearing the rooftop took a splendid gunfight, but we were told later that a diplomatic option would have been possible too. Using branching dialogue, you can talk your way around situations, either inflaming things to start a fight, or smooth-talking your way to a peaceful route. While you’ll obviously have plenty of obligatory shoot-outs, other parts will let you negotiate according to your chosen approach. Once on the right floor they plant a bomb and make their slow, winding escape. Except the bomb goes off too early, and the target isn’t killed. This leads to an extremely ferocious shoot-out, during which Joe gloriously throws one man through a window, while Tommy guns exchange roaring fire. Take a look at the video at the bottom of the page for some clips of this, showing off the sense of panic, and some of the destructible scenery. Throughout all this there were a number of perfectly performed cutscenes, setting the mood and showing off the stellar acting. There’s a concern, however: they were pretty frequent, and if this were the case throughout it could take control away from the player too often. It’ll be interesting to see how these are balanced. The Illusion Engine has taken 2K Czech three years to build (the name a nostalgic nod to the developers’ previous title, Illusion Softworks, before they were affiliated into the 2K ‘family’). It’s part of the reason why it’s been so long since the original game – the technology didn’t exist to create their ambitions, so they set about making sure it did. Along with the destructible materials mentioned above, there are many other specific factors that make it sound pretty special. There’s the weather effects, which will do more than look pretty. If it’s raining, or snowing as it is at the start of the game, then driving is affected. The cars will obviously be a whole lot more easy to control than Mafia I’s ‘30s wobbly boxes, but handling will change when the road is slick. There’s about fifty cars in the game, based on real world vehicles but not licensed. There’s a good reason for this – they can break. And licensors don’t tend to like it when you show how their cars fall to bits. Each bit of the car can be damaged, dented or broken off. Perhaps the most important element of the Illusion Engine is the complete absence of loading. Now, we’ve had this promise before from others, but 2KC are adamant it’s true this time. The entire city will manage all its buffering in the background, offering a seamless drive, but even missions will load without your knowing. This is all part of their effort to keep you in the cinematic experience as much as possible. While there will be a HUD, and indeed a proper minimap this time, such things are optional. There some concessions to the modern gamer. Health will be regenerating, which may cause a few to raise eyebrows at the emphasis on realism elsewhere (talking of which, they promise that hitting an enemy in the head will kill him in one shot, which will be worth a thousand percent on its own if true). And unlike Mafia I, there are difficulty levels to make things more accessible. The Illusion Engine was built from the ground up to work across all three platforms, 360, PS3 and PC, each able to live up to its full potential rather than limited by the restrictions of the weakest, but obviously there’s a desire to improve upon the rather poor efforts made when Mafia was ported to Xbox and PS2. Concerns about the game being simplified for a console audience don’t seem appropriate from what we’ve seen (and such concerns are as patronising to the console audience as ever). There are absolutely no plans for any form of multiplayer. This is a development team who are obsessively focused on the single player, and we were told that the time required to get this to the standards they’re aiming for, anything multiplayer would end up being half-arsed. 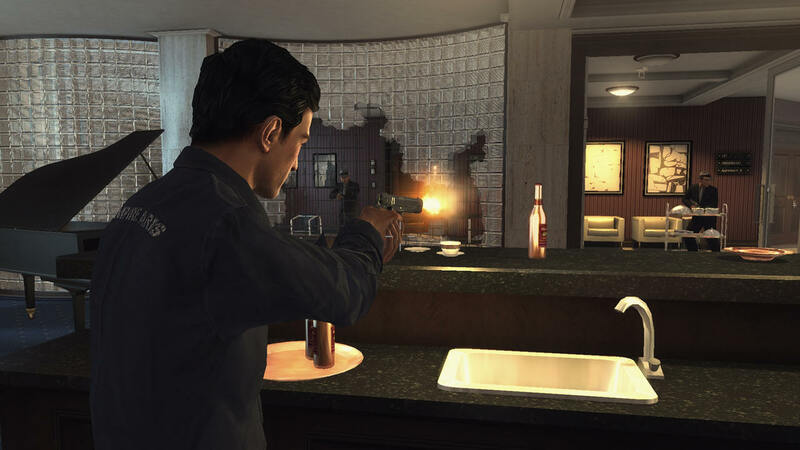 The degree of authenticity, both to the times in which the game is set, and to the legacy of one of the most engaging stories in gaming, looks like it could set Mafia II up for great things. Certainly the sheer volume of detail should be fascinating, and if the story lives up to their claims, it could be special. It’s still a long way off, not likely to appear before the end of the summer, and possibly deeper into Autumn. It will live and die on its story, no matter how impressive the details may be, and this far it’s the one thing we know nothing about. That we do know about, however, looks mighty impressive. Tagged with 2K Czech, feature, preview, Mafia II.